Footage of TC Coley being transported to the shores of Green Beach on Iwo Jima, February 19, 1945 at approximately 10AM. TC is in the middle of the frame at the wheel of an M3 Half-Track which has been fitted with a fording kit (air intake tube in right half of the hood and another to the far right of the vehicle) to allow it to drive through deep water without stalling. There are several indicators that the soldier in this video is, indeed, TC Coley. 1) The video description indicates that this is footage of the 5th Marine Division AND TC Coley was in the Weapons Company (WPNS), 28th Regiment of the 5th Marine Division. 2) TC Coley is not a common name like, for instance, John Smith AND the soldier in this footage very clearly has TC Coley written on the back of his shirt. 3) The soldier is in the seat of what appears to be a half-track AND TC Coley was a half-track driver. 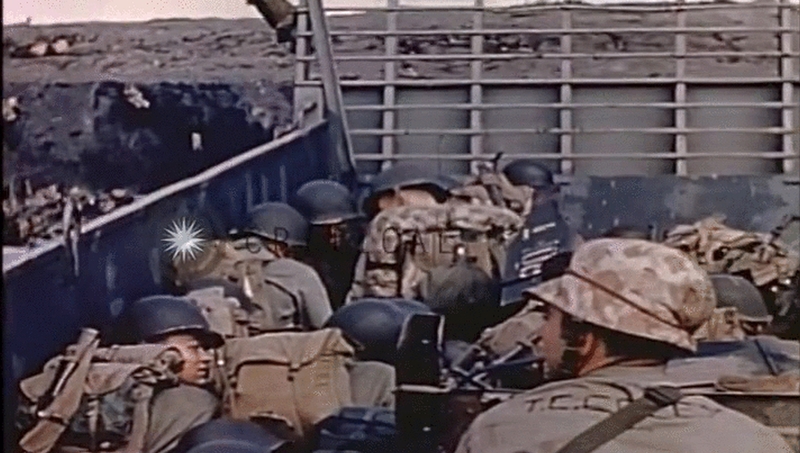 It appears that the entire video (see below), from which the previous footage is taken, was shot from inside the Higgins boat that TC Coley was in on the way to the shores of Iwo Jima. 2) James G. Shriver – Iwo Jima Veteran.